Diners have few choices when seeking a restaurant that bridges the gap between relaxed and refined. For couples rushing to the Performing Arts Center, or for families dining with children, a good restaurant meal can't last all evening or get too fussy. The Cantankerous Fish seeks to find the perfect compromise between fine dining and flexibility. With its modern stylish interior, excellent service, fresh and straightforward cuisine, this new spin-off from Scott's Seafood fills a niche in the Castro Street restaurant landscape. The balance between classy and casual shows throughout the restaurant: in the curvaceous architecture, the attentive staff, the approachable menu, the attractive presentation. All is tasteful, inviting and uncomplicated, with a nod to fashion and an acquaintance with tradition. 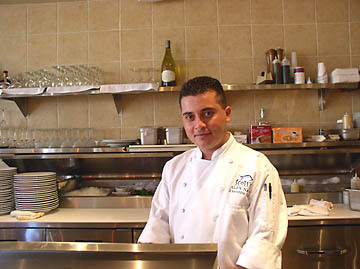 Only 27 years old, executive chef Alex Nava currently heads the kitchens at both Palo Alto and San Jose Scott's Seafood as well as at The Cantankerous Fish. Nava's family moved to the Bay Area from Michoacán, Mexico, when he was 15 years old. He worked part-time washing dishes at Scott's in Palo Alto while learning English in high school. He dropped out of school a year later, and within a few years worked his way up from dishwasher to prep cook, to line cook then sous chef under the tutelage of chef Eric Smith. Nava stepped up to executive chef at Scott's after Smith's departure, an impressive responsibility considering the success of the Bay Area franchise. Clearly, with three kitchens to manage, Nava cannot spend all his time at The Cantankerous Fish. Especially during its first few months, a new kitchen benefits immensely from the guidance of the chef who writes the menu. Without Nava's constant vigilance, I have seen a few small glitches in preparation. Yet overall, this new kitchen runs rather smoothly, and the food offers something for almost everyone. During our recent visits to the Cantankerous Fish, tables filled up fast with early diners. Tall bar tables near the front door relieved some overflow, but many clients opted to wait for more comfortable seating inside. During warm weather, the spacious front patio offers a popular alternative. Weekday happy hour lasts from 4-6 p.m., with $3 house wine, beer and well drinks, and $2 discount on items from the bar menu. We found the restaurant rather quiet one weekday afternoon; but by 6:00 p.m. it began to fill up with dinner guests. We sampled the crispy fried calimari ($4.95), and Hawaiian style chicken skewers ($5.50). The calimari came in heaping quantities. It had a firm al dente texture, not rubbery, but the slightly greasy breading made me guess that it could benefit from hotter cooking oil. The creamy beurre blanc dip offered a welcome variation to tarter or cocktail sauce. The bartender apologized when he brought the chicken skewers, explaining that the kitchen had run out of pineapple. Later he subtracted the chicken from our bill. Such responsive service can well offset a missing ingredient. The four small skewers of tender grilled chicken came on a bed of sauteéd squash and bell peppers with a dusting of black sesame seeds, accompanied by a light teriaki sauce. At dinner or lunch, the small plates range in price from $6.95 for zucchini cakes or calimari to $11.95 for steamed Manila clams. The seared ahi ($10.95) came plated on a salad of red cabbage, iceberg lettuce and cucumber, dressed with light sesame oil, soy ginger dip on the side. The four triangular slices of tuna had been cooked medium-rare earlier in the day, then chilled. I found the ahi somewhat disappointing, prefering it raw inside and charred for only a moment just before serving. Despite being slightly overcooked, however, the tuna tasted fresh. The Pancetta Wrapped Prawns ($9.50) presented a savory combination of salty ham surrounding four sweet medium-large prawns, hoisted to the top of a tall martini glass on a bed of lettuce, red onion, black beans and diced mango. Crispy outside and tender inside, the prawns were delicious. Among the large plates that I have tried, one of my favorites has been Cantankerous Cioppino ($16.50), a hearty rendition of the classic North Beach Italian seafood stew. Clams, mussels, shrimp, scallops, chunks of salmon and white fish sat in a buttery spiced tomato broth with garlic, white wine, fresh basil and Italian herbs. A wedge of garlic toast perched alongside. A special blackened pan-seared sea bass ($17.95) showed well calibrated gentle spiciness that didn't dominate. Topped with a diced salsa of mango, papaya, bell pepper, onion and tomatoes, the flavors merged light freshness with buttery char. Mashed potatoes and green beans accompanied the fish, in a puddle of melted butter. 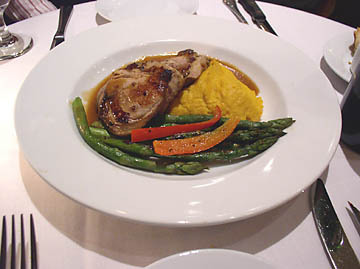 Curious about some unfishy dishes, I tried the grilled marinated pork tenderloin ($13.95), a promising marriage of sweet flavors with caramalized apple glaze and mashed sweet potatoes. The glaze of puréed apples, reduced with beef stock and whisky, harmonized with the pork in a classic marriage. Cracked coriander seeds atop the meat added more sweet aromatic notes. The meat itself, however, appeared to have been sautéed in slices rather than grilled as a chunk prior to slicing into medallions. Minor technicality though this may seem, it resulted in a medium well-done dryness rather than the prefered medium-rare pink that I had requested. Once the line cooks master their timing, the pork tenderloin could become one of the best dishes on the Cantankerous menu. Currently the dinner menu does not list any vegetarian main courses, but when I spoke to chef Nava he explained that the kitchen will be happy to handle special requests. The lunch menu does include a vegetarian grilled portabello sandwich ($6.95) among other meat sandwiches and dinner menu items. During happy hour we tried the house merlot from Stone Cellars ($3, normally $4), a simple fruity wine but a good value. 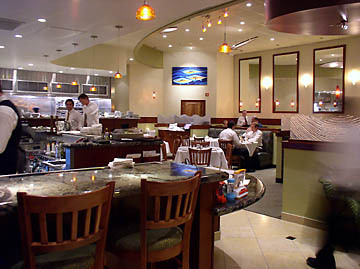 The bar menu also lists a variety of house cocktails, with several variations on martinis and sweeter drinks. I would especially love to see more inspired choices of pinot noir, the one red varietal that pairs elegantly with salmon and shellfish. The white half of the list could benefit from choices of white Bordeaux or Burgundy, or even a California viognier, which can pair beautifully with oysters or clams. Corkage costs $15 if you bring your own bottle, possibly worth the expense if you bring something special. Water toys and a children's menu await takers at the front desk, a rare invitation for parents to bring their kids to dinner. The well-aimed kid's menu has games on one side and includes items like grilled cheese sandwich, hamburger, chicken fingers, fried shrimp, calimari and liguini with red or cream sauce. Kid's dishes cost only $5, and include beverage and ice cream. Parents can substitute fresh vegetables for French fries. To appeal to the kid in all of us, desserts are made in house daily. I sampled several on different occasions, and found them quite tasty. The marble cheesecake ($5.95) had a smooth texture, not cloyingly sweet, but soft and rich. The plate came decorated with blueberries, raspberries and zigzags of créme Anglaise. The key lime pie ($5.75) arrived alongside a scattering of berries, whipped cream and a lime slice. Its citrus tartness offered a refreshing end to the meal. The chocolate peanut butter pie ($5.50) tasted lighter than it looked. With creamy peanut custard under a hard chocolate crust with Oreo crumbs underneath, it resembled a fluffy Reeses cup. The food here is fresh and attractive, not flawless, but straightforward and satisfying. The service shines with attentive detail, and the atmosphere succesfully blends casual and stylish elements. The Cantankerous Fish has forged an appealing compromise for busy Silicon Valley lifestyles, whether for quick business lunches, theater night dinners, or couples with kids in tow: a classy choice for a casual seafood meal. Dinner 7 nights, Happy hour 4-6 weekdays.